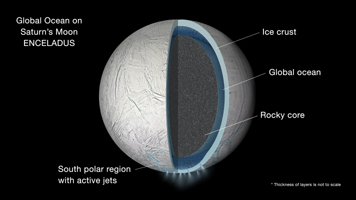 This illustration is a speculative representation of the interior of Saturn's moon Enceladus with a global liquid water ocean between its rocky core and icy crust. The thickness of layers shown here is not to scale. Scientists on NASA's Cassini mission determined that the slight wobble of Enceladus as it orbits Saturn is much too large for the moon to be frozen from surface to core. The wobble, technically referred to as a libration, reveals that the crust of Enceladus is disconnected from its rocky interior. This graphic is an update to PIA19058, which showed only a regional sea beneath the south polar region of Enceladus. Enceladus is 313 miles (504 kilometers) across. The Cassini mission is a cooperative project of NASA, ESA (the European Space Agency) and the Italian Space Agency. The Jet Propulsion Laboratory, a division of the California Institute of Technology in Pasadena, manages the mission for NASA's Science Mission Directorate, Washington. The Cassini orbiter and its two onboard cameras were designed, developed and assembled at JPL.